Tryptophan, which is a naturally occurring amino acid (a protein building block), has been found to be an effective treatment for several of the signs and symptoms of autism. According to SelfNutritionData, the food that is highest in tryptophan is a particular species of Sea Lion*, followed by game meat and seaweed. Foods that we actually eat include spinach, fish and eggs. Milk is way down on the list. And, duck contains more than turkey. Following that, researchers who measured whole blood serotonin and tryptophan in ASD vs. neurotypical patients suggested, “… the possibility that increased gut production of 5-HT might cause…” elevated levels in the autistic population. 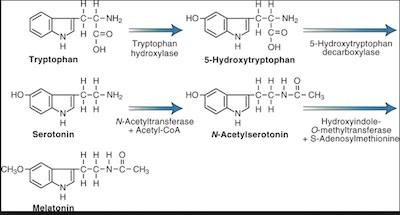 To achieve higher CNS levels, it seems reasonable to administer 5-hyroxytryptophan (shown in the figure), which is available as a natural supplement. Using 5-HTP seems preferable, since there could potentially be a block at the first step. The dose varies from <50mg to 200mg per dose, and frequency may be up to 3 times per day. Obviously, administration depends on the individual patient’s age, size, diagnoses, etc. Parents frequently report that melatonin shortens sleep latency (the time that it takes to fall asleep), but nighttime awakening can occur. By adding 5-HTP before bedtime, conversion to melatonin helps maintain sounder sleep. Often, families observe that anxiety and subsequent frustration leading to aggression can be better controlled by administering this supplement on a daily basis. Likewise, more focus and attention may accompany administration of tryptophan, making it one of the more commonly prescribed supplements in the ASD toolbox. As noted in the figure, one of the metabolites is melatonin, which influences sleep. Parents who notice that the child becomes less active or lethargic can simply lower the dose or frequency in order to mitigate that effect. Patients who take SSRIs (prozac, etc.) may experience an exaggerated response. Therefore, caution is warranted in such individuals. Interestingly, this effect is sometimes useful when attempting to wean children off of those pharmaceutical preparations. Rarely, individuals experiencing signs and symptoms of ASD actually get more hyperactive when taking this supplement. It’s difficult to understand this phenomenon, but by discontinuing the tryptophan, there is return to the previous state. The experience of many parents has been positive, and this supplement has become a mainstay of biomedical intervention. My advice is to give it a try, about 1/2 hour prior to a high-anxiety event, such as church, a shopping mall, or restaurant, for example**. *As an aside, 1 ounce of Stellar Sea Lion contains more than 2-1/2 grams of tryptophan, as well as selenium (498 % RDA), copper (97%), phosphorus (43%), iron (39%), and zinc (36%). Not available at Trader Joe’s. 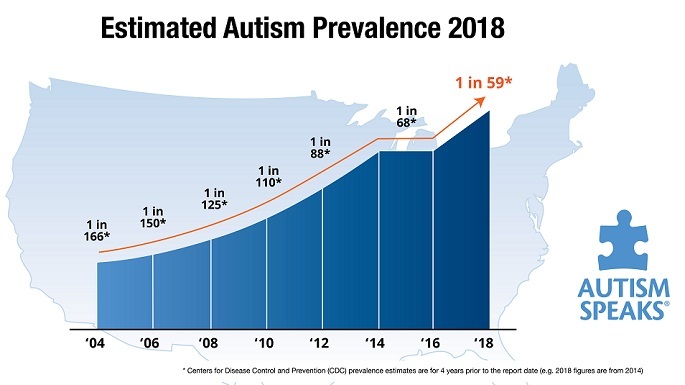 **As in all things dealing with ASD and medical intervention, be sure to check with your physician prior to administering any supplement to your child. This entry was posted on Sunday, October 11th, 2015 at 9:42 am	and is filed under >ALL<, AD/HD, Alternative and Complementary Medicine for ASD, Asperger's Syndrome, Autism Therapies, Gastrointestinal Issue, Genetics, Patient experiences, Research, Reversing autism, Sensory issues, Sleep, Speech and Language. You can follow any responses to this entry through the RSS 2.0 feed. You can leave a response, or trackback from your own site. where do you buy this Stellar Sea Lion. All I find online is the animal. Right… the Stellar Sea Lion is an animal found off northern Pacific coasts from Japan to California. I was just pointing out that it appears to contain the highest natural concentration. Getting conflicting information on 5-HTP safety for toddler. Is there any publication on recommended dosage and safety for a 2 years old ASD suspect? It’s an amino acid… by trying 50mg 1-3 times per day, you can always stop if the child gets agitated or sleepy. Or you can see if things calm down a bit. Safe? compared to what? Of course this is not medical advice, and you can ask your pediatrician if you aren’t sure. Selective serotonin re-uptake inhibitors, usually for depression.